He just turned 14. I’ve had him for 10 or 11 years. I’ve just found out that he won’t make it to 15. He probably won’t see much of 14 even. He’s very very ill and the vet has informed us that even the most aggressive treatment will mean the difference between his leaving this form between any moment and a few months from now. It’s heartbreaking to me. After a decade, I could not love a son more than The Grendel. I’d set every guitar I own on fire if it would make him better without a moment’s hesitation. 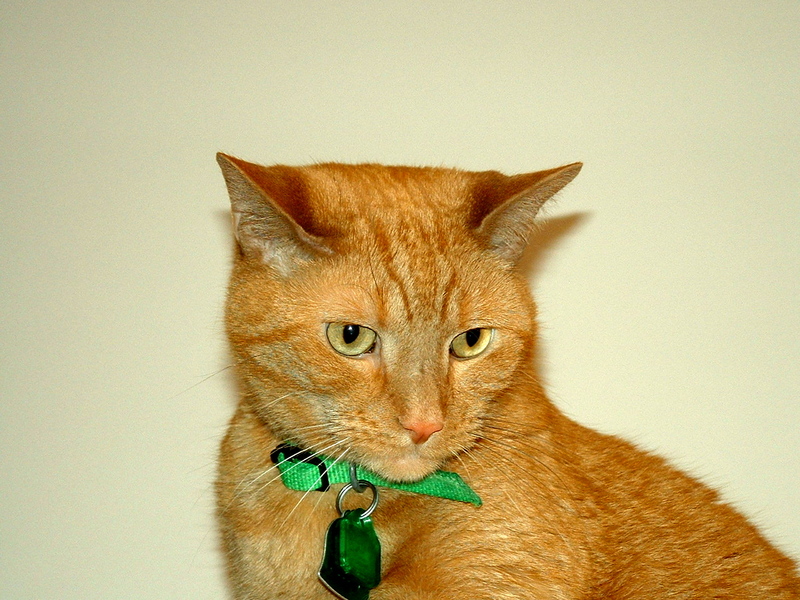 When I lived in Sylmar, my cat Oliver died from old age and that was hard. (“Hard” in the sense that as a child, I went to something like 14 funerals of family and friends in a single year and have attended many more since then. I understand loss intimately.) I buried him in the backyard in my favorite shirt, and I cried like a little boy for a while. This creature with a plum sized brain has taught me so much. He taught me to be generous. He taught me to give of myself and to do everything – eating, sleeping, playing – with all the attention and energy available to me. More than anything, he taught me to be grateful. Grateful for the time I had with him. Grateful for the lessons that he taught me. Grateful for showing me the love I had in my heart and for being someone I could give it to unconditionally. I love my guitars but they’re just a tool. I use them like I’d use a favorite pen – but I’ll never love a guitar like I love The Grendel. So now I try to make him comfortable. I try to give him what I can and try not to cry as Candace takes pictures of him being cute. There are lines to get under my fingers, songs to record, things to write – but those things will wait. Those things will still be there tomorrow. My boy is here today. The important things in life are the things you do. 20 years from now – you won’t remember that thing you saw on YouTube. You’ll remember the moments that were real. You’ll remember the warmth of the sun on the back of your neck as you and your beloved are walking towards the perfect skyline. You’ll remember the freckled lip and the silent meow. As a musician, your job is to express something and move other people. To do that you need to develop substantial skill, but you also need to live a bit to have something to actually say. It’s why a 13-year old boy will probably not write the most devastating love song you’ve ever heard – even though he’s convinced that it could not be any heavier. Having things to say takes time, it takes other people and it takes other experiences. Being a little older you see the balance in keeping both those things in check. A long time ago, I realized that death gives life meaning. It’s only in the finite that there is a sense of urgency to accomplish something. If you had forever to get good at guitar, it wouldn’t mean much because everyone would eventually get good at it. It saddens me that my boy will eventually be gone but that’s the price of being here and I wouldn’t give up my time with him for anything. Everybody gets a ticket at birth and at some point, somebody collects the ticket. The good news (other than the fact that you get a ticket at all) is that once you’re tall enough to get on the ride – you get to determine both the ride and how you interact with it. It’s a tremendous amount of power. Use it passionately. Use it wisely. Use it to make the world a better place. For now – I have to go learn whatever lessons The Grendel’s willing to teach me. This entry was posted in Lessons, Personal Development and tagged death and meaning, Finding The Deeper Lesson by GuitArchitecture. Bookmark the permalink. Nice post! Find the meaning in life knowing that it is soon to be over. Love, however, is eternal. This is the stuff. Enjoy the days with him while you can. It is always amazing what we learn from any life that touches us- and it doesn’t seem to matter what life that may be. Well said.